When I was growing up in Toledo, Ohio, I dreamed of someday living in New York City. I’d have an apartment in Greenwich Village, drink martinis, marry a handsome publisher, and own three Siamese cats. 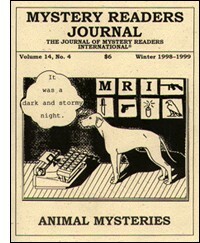 For thirty years, the North cats were the First Felines of Mystery Fiction. They were on the scene, generously assisting their owners with crime solving, long before KoKo and Yum Yum gnawed their first catnip mouse. They had plenty to say, most of it in purest Siamese, before Midnight Louie meowed his first wisecrack. And if they didn’t get writing credit like Sneaky Pie Brown, they were definitely the whiskered muses of their two fond creators, Frances and Richard Lockridge. Cats were there from the beginning. In Mr. and Mrs. North Meet Murder, first published in 1939, we meet Pete, a jaunty black-and-white tom who happens to be a witness to murder. In fact, not only is Pete’s manner of ingress and egress to the apartment where the murder occurred one of the major clues, Pete is on the scene for the inevitable confrontation with the killer. Pete looked at Weigand and came to investigate. He smelled Weigand’s shoes and rolled over to be tickled on the belly. Weigand tickled him. Pete scratched playfully, drawing blood. He was, Weigand saw, the same Pete. The Lockridges didn’t sentimentalize about cats, but they did anthropomorphize to some extent (although, given the state of cat mysteries today, little did they know). By 1943 and Death Takes a Bow, Pete is off the scene and two new cats are filling his large black paws. Ruffy, a small gray cat with a white collar, was always talkative. She spoke a little querulously to Mr. North, chiding him for his long absence. Toughy regarded him with baleful yellow eyes revealing the Siamese which had, a little mysteriously, invaded his blood stream. He flattened his ears, twisted his long, bushy tail and waggled the tail’s tip. It had been too much for Toughy and Mr. North realized this a moment too late. Toughy, the pleased center of all eyes, recognized his duty. Toughy would now entertain. And he does. Maybe it’s the curtains, but for whatever reason, Ruffy and Toughy are absent from the North home by 1946—but that little hint of Siamese in Toughy’s bloodline seems to have touched something in Pam, because in Murder Within Murder, she meets Martini, the cat of her life. A tiny animal was perched on her right shoulder. It looked at him through bright blue eyes, with bright interest. It said “yow!” It kept on saying “yow!”, not in displeasure, so far as Jerry could see, but merely to show interest, awareness and presence. Jerry picked the little cat off Pam’s shoulder. It began to purr instantly upon being touched; there was a great deal of purr for so very little cat. The cats, with one voice, assured Pamela North that they had not been fed; that they were never fed; that at the residence of Mr. and Mrs. Gerald North, cats were abandoned to starvation. Pam did not believe a word of this, and told them so. Nevertheless, she went first of all to the kitchen, moving in a swarm of cats. At dinnertime, three cats were twenty cats; if Siamese, twenty desperate tigers crying out. They screamed up at Pam as they moved around her feet, creating, with long bodies and dark tails, patterns of infinite anxiety. The Sunday newspapers had cats in them. Jerry North moved, suddenly, halfway across the room and removed Gin from the book section of the Times. He returned, clutching the book section of the Times, and Sherry leaped from the couch, landed, somehow, under the amusement section of the Herald Tribune. The amusement section of the Herald Tribune began to travel, erratically, across the room. Jerry rescued that. Martini, who had been watching her offspring with pleased approval, took a dim view of their dispossession. She looked up at Jerry, lashed her tail, and said “Yah!”. The younger cats stopped and stared at her. Gin leaped, landing on her back, rolled her over. The two cats, locked, apparently, in a death struggle, rolled into the Times’ Review of the Week. Pam … decided to change her dress. The cats accompanied her and sat, two on a bed and one on a dressing table, staring with round blue eyes, as if never before had they seen any action so incomprehensible. Just before Pam heard Jerry’s key in the lock, the three cats turned their heads simultaneously toward the hallway which led to the living room, which was where the door was. This meant that they had heard footsteps in the outside hall. But they did not leap from perches and gambol down the hallway, which meant that they had heard alien footsteps, along with those of Jerry, and chose to bide their time. The cat called Gin had been ill, and visited by a veterinarian, so that now any unaccounted-for arrival might presage a hypodermic needle in the rump. In real life, the Lockridges had at least as many cats as the Norths, and their veterinarian was an eccentric cat-specialist who made house calls and wrote a book called All My Patients Are Under The Bed. The Lockridges immortalized him in The Judge Is Reversed and there’s a hilarious scene where the doctor and three cops have a hard time holding down one reluctant Siamese who doesn’t want her shot. But there’s a sad note in that book as well; the beloved Martini has died, and Pam is searching for a new cat to love. The final cats in the North family are also Siamese. Stilts was a cat who walked tall; she was, save for slightly crossed eyes, everything a Siamese ought to be. When Frances Lockridge died in 1963, so did Mr. and Mrs. North and all their cats. Richard went on to write more Lt. Heimrich books, and he even married a second time (to another cat lover, of course). But through the magic of fiction, Pete, Ruffy, Toughie, Martini, Gin, Sherry, Stilts and Shadow live alongside Pam and Jerry North, Bill and Dorian Wiegand, in the New York City of the mind, where cigarettes are smoked and martinis drunk without ill effects, and where murder barely interrupts the long cocktail hour. Two of the questions most commonly asked of an author are: “Where do you get your ideas?” and “How long did it take you to write?” Both are equally hard to answer. Usually when I start a book I write the date in my diary. Then I make another entry the day it’s finished. But that takes no account of the weeks, months, sometimes even years of playing around with an idea in the back of my mind. I’m a great believer in the subconscious doing a lot of the work. Then, more often than not, one day, you turn a corner and suddenly all the loose ends come together and gel. For instance: when I came to write my first mystery novel I knew the name of the main character—Monsieur Pamplemousse. And I knew what he looked like: he would be in the same mold as a wonderful old French actor called Raimu, who had brought me great joy in my early cinema-going days. And if one accepts that “comedy is unreal people in real situations, and farce is real people in unreal situations,” then he would lean towards the latter, for he would be accident prone and much given to landing himself in compromising situations. Why French? Well, I am an unashamed Francophile. I love France and I wanted the opportunity to write about a country and a people who have enriched my own life beyond measure. For a while I pictured Monsieur Pamplemousse being the last Paris detective still riding a bicycle. (Don’t ask me why!) I even bought myself a French machine in order to get the feel of it: a Vainqueur Galaxis, with dropped handlebars, rat-trap pedals and a ten speed derailleur gear. But the leather racing saddle proved to be much harder than I remember saddles being when I was a boy, and the hills where I was living at the time, much steeper than I pictured from inside a car, so I quickly gave up that idea. Another problem was that I didn’t want the books to be set entirely in Paris. France is a large and varied country, and it seemed a pity not to make use of that fact. My knowledge of French police procedure was also rather hazy. I just about knew the difference between a gendarme and a member of the National Guard, and that was it. Then one evening my wife and I happened to be dining at a restaurant called Pic in the Rhone Valley. We had ordered in advance one of Monsieur Pic’s specialties—Poularde Breese en Vessie—which involves stuffing a large Bresse chicken—the best in all France—with seasoned foie gras, and slipping generous slices of black truffle beneath the skin. The whole is then encased in a pig’s bladder and gently cooked in a pot of vegetables and chicken consommé. Taste buds began to salivate as the moment critique drew near. Diners at nearby tables paused to watch as the maître d’hôtel presented the dish, then with a flourish applied the tip of his knife to the outer casing. As he did so the writer in me wondered what would happen if something other than a chicken was revealed. Someone’s head, for example? Suddenly everything fell into place. Monsieur Pamplemousse would be an ex-member of the Paris Sûreté, now working as an Inspector for a famous food guide; a job which would involve him in travelling all over France reporting on hotels and restaurants. And instead of riding a bicycle, he would be wedded to an ancient Citroën deux chevaux; the kind of car that Monsieur Hulot might have driven. But who would occupy the passenger seat? Well, as so often happens in France, Madame Pic looked after things out front. She was aided and abetted in her task by Giankin, a large black dog who took a proprietorial interest in all that was going on, particularly when it came to over-seeing what the customers were ordering. He never bothered people at the table, but simply watched points, making it seem as though his nod of approval was something to be sought, for clearly it wasn’t given lightly. The sight of him eyeing our table that evening triggered off another idea. What better companion for Monsieur Pamplemousse than a dog with gourmet tendencies, who would add weight to his master’s gastronomic deliberations. Perhaps a bloodhound who had also worked for the Sûreté, but had been made redundant because of a cutback? A leaving present for Monsieur Pamplemousse from his colleagues? Pommes Frites would be a good name. Laptops not having been invented, I had to content myself with jotting down notes on the back of old envelopes, but as soon as we arrived home I sat down and wrote what was to become the middle chapter of the first book (Monsieur Pamplemousse, Beaufort Books, 1985). I wanted to establish the relationship between Monsieur Pamplemousse and Pommes Frites before I went any further. It was important for them to have total trust in each other, yet at the same time remain blissfully ignorant of the other’s thoughts. The reader would see both sides, aware—even when Monsieur Pamplemousse wasn’t—of the important part his faithful hound was playing. It worked to my satisfaction and they have been together ever since, meeting up with trouble of one kind or another wherever they go. Giankin is sadly no longer with us, but his spirit lives on in the eleven books that have been published since my wife and I first dined chez Pic. He has been a fountain of inspiration and the Poularde de Bresse en Vessie was absolutely delicious. It certainly received full marks from Pommes Frites when it appeared in the first book, and he should know! The most recent M. Pamplemousse/ Pommes Frites books are M. Pamplemousse Tells the Tale (Avon, 1998) and the M. Pamplemousse Omnibus Vol. 1 (Allison & Busby, 1998). I write rovers à clef. There are two characters inspired by real-life dogs in my mysteries. Most people know only one: Esskay, a rescued racing greyhound introduced in my second book, Charm City (Avon, 1997). In describing the first meeting between private investigator Tess Monaghan and Esskay, I fell back on real life and simply transcribed my first encounter with Dulcie, the greyhound who came into our family five years ago. It was a dog, a bony, ugly dog with dull black fur and raw patches on its hindquarters. The brown eyes were vague and unfocused… the shoulders hunched in an uncanny imitation of Richard Nixon. Okay, not quite love at first sight. But let me tell you, putting ointment on a dog’s bedsores accelerates the bonding experience. In a ridiculously short time, the shy, colorless dog we brought home from our local rescue group had blossomed into a confident, happy hound, with gleaming fur and bright eyes. She pranced down the street, sure that everyone was looking at her. After all, she was named for Dulcinea, Don Quixote’s maiden fair. Everything about Dulcie fascinated me. I liked watching her run at full speed around our small backyard, rear legs kicking up like a crazed kangaroo. I adored her grin, no other word for it, reserved for our homecomings and certain treats. I noticed how she laid her long body down in pieces, a section at a time, until the head landed with a loud thunk. There was even a part of my mind that sat back, taking notes, as I pried a small dog from Dulcie’s jaws one morning. (It was a tiny puncture wound, harmless to the dog, although the vet bills wiped out my winnings in that year’s Kentucky Derby.) With Baltimore Blues (Avon, 1996) finished, I looked around for inspiration and saw Dulcie spread out on the couch, legs twitching as if she were forever chasing that elusive mechanical rabbit. And so a greyhound appears in Charm City, winning Tess’s heart as surely as Dulcie won mine. The fictional Esskay—named for a local sausage company—is a wonderful character to write, as odd as that may sound. She’s my Harpo Marx—silent, sweet, a crazed cherub that you ignore at your peril. The summer before last, the real Spike unlocked our back gate. The neighbors, who had seen this escape act at least a dozen times, later told us he would put his head beneath the pickets and nudge the gate up and down until the latch popped out. On this scorching July day, he wandered into the alley and was hit by a car. Or so we conjecture. Whoever hit Spike left him there, still alive, blood pooling in his lungs, one leg broken, his ribs cracked. We found him in time to take him to the vet, where he died on the table. I think a lot about the person who hit our dog. The alley is rough, a bumpy patch of pavement where children play—how fast were you going? Did you know Spike was still alive, or did you just continue, assuming he was dead? Are you one of my neighbors? It’s rare for anyone else to drive down this one-block stretch that leads to nothing but driveways. I also think about our personal responsibility in Spike’s death. Why didn’t we fix the gate? These questions, however banal or melodramatic they may seem, go to the heart of each mystery I write. Evil is fascinating, as are monsters, but I am more interested in ordinary people who find themselves crossing some line they never thought they would cross. In a world where few secrets seem essential to keep and where shame is virtually non-existent, how does an average person rationalize one’s way into murder? Disregard for human life often begins with disregard for animal life. At the same time, a local woman who starved her own daughter to death fretted when she was detained for questioning. She was really worried she wouldn’t get home in time to feed the cat. I may never sort out the feelings I have when I sit down at my desk, which overlooks the alley where Spike was hit. But I can make this promise to my readers: No matter who dies in Tess Monaghan’s world, Esskay the greyhound will live forever, and Spike the bookie-bartender will never take a bet on a dog race.